While I'm finishing up the last pieces on my dress, I've started working on something a little different: a vintage needlework pattern from 1940! There is an amazing wealth of color in this enchanting garden scene of the famous old House of the Seven Gables at Salem, Mass. 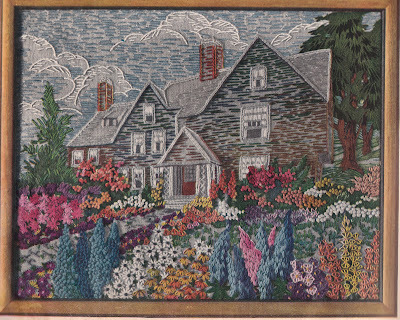 The flower masses are worked in simple everyday stitches and stand out brightly in contrast to the dark tones of the house. Here are larkspur, daisies, snapdragon, foxglove, etc. Work on smooth, closely woven linen in a warm, medium shade of gray. I was lucky enough that someone had already purchased the linen, stamped the transfer and started the pattern! So all the thread and everything came with this pattern! So now I just have to finish this beautiful project! It's nice knowing that I will be working on something that someone else put so much thought and work into already!! 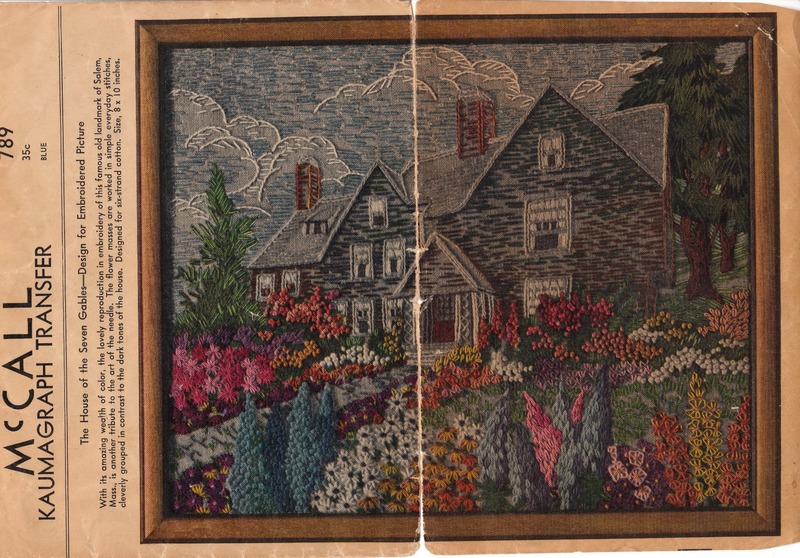 Have you every done any vintage needlework? Wow! That is a great project! When you finish it, will be an edge to the wall? I do love my cross stitch. I have a couple of vintage charts but haven't tried any of them yet. I'm looking forwards to seeing how this turns out - it'd be great if you could show us some of the stitches you use. Am I right in thinking the flowers at the back use knots? There is no end to your talents, Debi!! It's so pretty and I'm looking forward to seeing it finished. 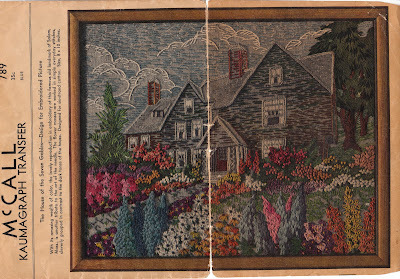 I've never done needlework - & this is lovely - I especially love the flowers! It sounds like a perfect way to be sociable & keep stitching fingers happy! Neat! Yes, I've done vintage needlework. I've a beautiful (what else?) forties "Mexican" blouse pattern that I embroidered and made up. I'll have to post a pic soon!